‘Fa’, literally means ‘become rich’, is undoubtedly a well-received word amongst Chinese communities. This is proved by the fact that many of the Chinese New Year greetings contain ‘fa’. Well, how about being lucky and ‘fa’ in the same time? 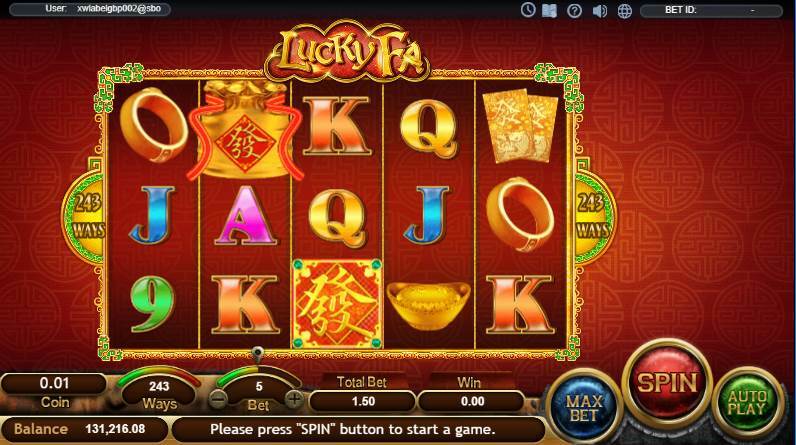 Try out Lucky Fa now! The average expected long term return to player (RTP) percentage for this game is 95%. Note: In case of malfunction, all game plays and payouts will be voided. Feature can be triggered again during the feature. Free Spins are played at Denomination and Bets of the triggering game. Wild Symbol appears Stacked on Reel 2, Reel 3 & Reel 4 only. Substitutes for all symbols except Scattered Symbol. Spin – Activates a spin with selected bet and coin denomination settings.